Letterman says goodbye, and brands, celebrities, and presidents pay tribute; Protestors take on McDonald's over wages; Consumers frustrated with early stages of Takata recall. 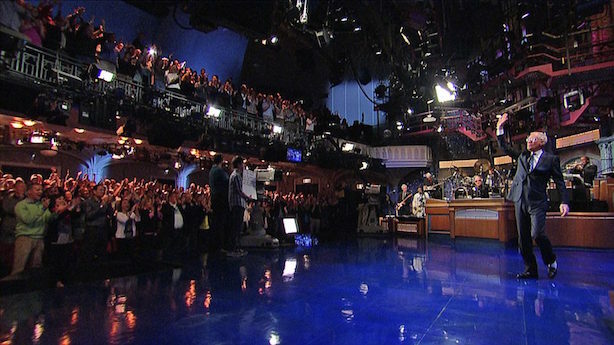 David Letterman waves goodbye to the audience on Wednesday night. 1. David Letterman said goodbye on Wednesday night with a poignant and widely praised exit from the Late Show featuring tributes from President Barack Obama and three of the four living former presidents, as well as a star-studded final top 10 list. Late-night competitor Conan O’Brien paid tribute by asking viewers to change the channel to Letterman, while brands such as Arby’s, Coca-Cola, and Tide tipped their caps on Twitter. So did Democratic presidential candidate Hillary Clinton. 2. Protesters are planning to take over McDonald’s annual shareholder meeting today, demanding higher wages and a right to unionize. Nearly 2,000 activists rallied on Wednesday at the company’s headquarters outside of Chicago. 3. Consumers are puzzled by the Takata recall affecting 34 million US automobiles as carmakers sort out which models should be brought back. "It’s been very tough to follow," one Honda Accord owner told The New York Times. "Very confusing." The head of Japan’s auto lobby said this morning that he doesn’t expect an interim report on the issue until the end of this year. Crisis communicators said this week that they’re looking at the recall as potentially a landmark case study that will be taught years in the future. Takata airbag recall bigger than Tylenol from the 1980's. FINALLY a new case study for PR majors to beat like a dead horse. 4. Sen. Rand Paul (R-KY) spent nearly 11 hours on the Senate floor on Wednesday filibustering the renewal of the controversial NSA domestic surveillance program. The initiative will expire at the end of this month if Congress does not renew it. 5. ISIS has taken about 50% of Syria’s territory including the historically important city of Palmyra, home to ancient ruins familiar from many films. The extremist group’s gains are casting more doubt on the Obama administration’s strategy for fighting the organization. 6. Spotify is branching out into podcasts and video via partnerships with major media companies. However, the service’s CEO emphasized its role as a music distributor and its place in consumers’ lives at a New York press event on Wednesday. 7. EBay is testing a competitor to Amazon Prime in Germany, with plans to roll out the service more broadly in that country in the second half of this year. The company is promising fast shipping and discounts. Beyoncé is making decisions for 'Vogue.' If she was an editor, how would you pitch her?